Stratford Ceiling Tiles is rated 4.8 out of 5 by 117. 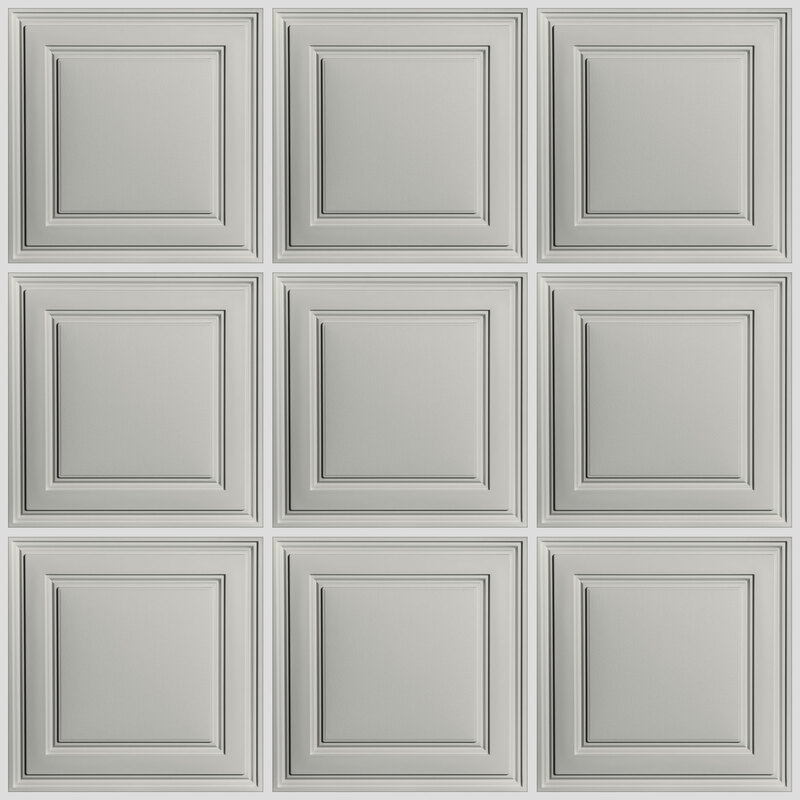 Stratford Ceiling Tiles are cost-effective, easy-to-use, and by far our best-selling style. Made from our Feather-Light Series 0.013 in. thick vinyl plastic, they are unlike any ceiling tile you will ever see or feel. You may be surprised by their minimal weight, but their thermoformed design combined with the inherent strength of vinyl makes these tiles rigid, durable, and easy to install and maintain. When cutting to use as border tiles, how do you handle the pattern? do you use a plain tile for the border if small? The Stratford is one of Ceilume's best selling tiles in part because it does not require a separate border tile for the perimeter areas. The design of the Stratford does not project downward so it sits flush in the grid even when cut down from its full size. You can view many customer provided photos of Stratford installations by copying/pasting this link into your browser: https://www.ceilume.com/gallery/Stratford/ Give us a call at 800-557-0654 to request a free full-sized sample of the Stratford so you can experiment with it in your ceiling grid. 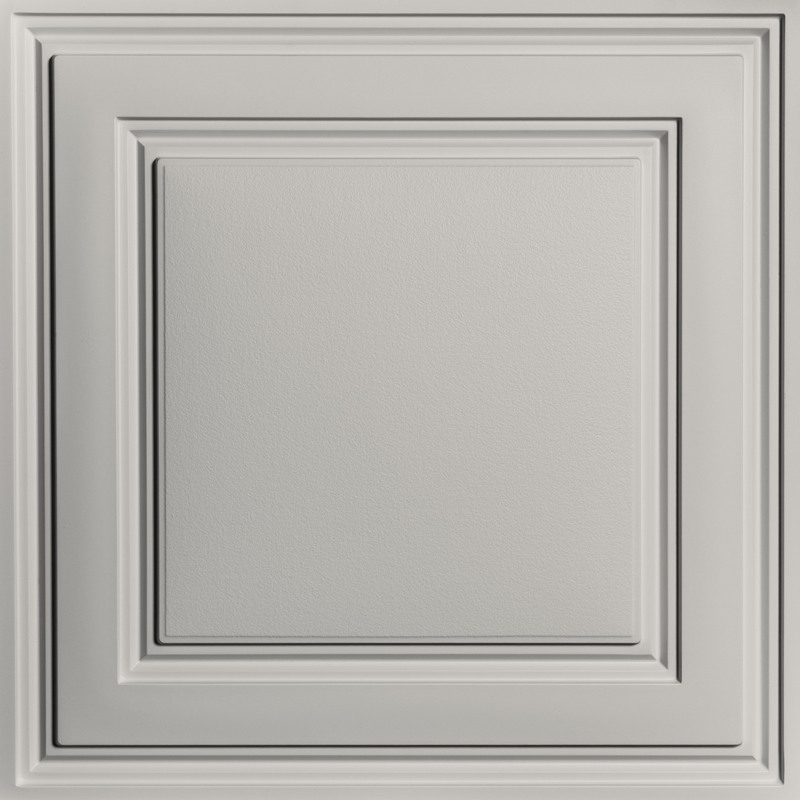 What color and brand of paint will match Stratford White 24 x 24 ceiling tiles? The safest way to match any Ceilume ceiling tile color is to request a physical sample and have your local paint store create a match from that sample. Give us a call at 800-557-0654 and we can take that sample order right over the phone. Stratford tiles are very thin and flex when handled, but that doesn't make them flimsy or cheap. Thanks to their durable vinyl material and geometric shape, they sit well in a ceiling grid. Don't be afraid to touch the tiles if you need to; facility managers chose our tiles because they can be removed and reinstalled repeatedly without damage and finger prints will wash right off with a damp rag. And since the Stratford is impervious to moisture, it won't absorb humidity and sag over time like the old mineral fiber ceiling tiles do. We're confident that your Stratford tiles will add trouble-free good looks to your ceiling for many years to come. 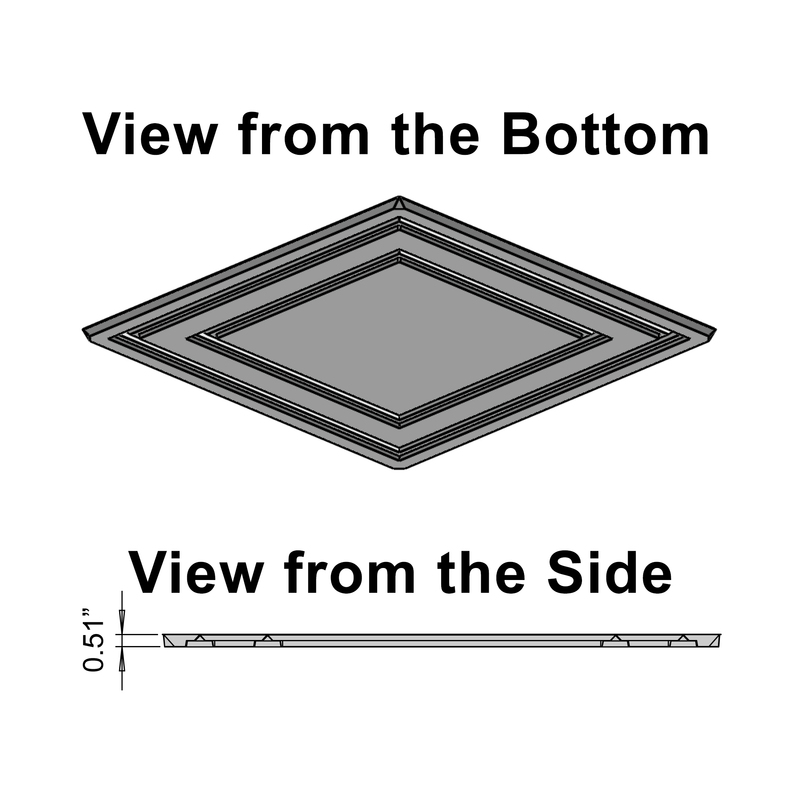 The Stratford tile can only be installed in a standard 1&quot; or 15/16&quot; ceiling grid. I am interested in putting a 2x2 LED light above a translucent or frosted panel. Any suggestions on why one is better than the other in this application? Thank you. The highly scientific answer is &quot;It depends...&quot; The Translucent Stratford allows allows just over 31% of light to pass through whereas the Frosted Stratford allows almost 77% of light to pass through. For ambiance, the Translucent material creates a warm diffuse light. The Frosted material lets through much more light for a brighter space. Copy and paste the following link into your browser to see a side-by-side comparison of the 2 materials (images are about half way down the page) https://www.ceilume.com/pro/lighting.cfm Feel free to call us at 800-557-0654 to request free full-sized samples of each tile so you can decide which will work best in your space. Ceilume's Stratford tiles are intended for installation in a 1&quot; or 15/16&quot; wide ceiling grid; they can not be glued to any ceiling. Ceilume does have 17 different glue-up ceiling tiles but we dont recommend installing any of them over popcorn finish as the uneven nature of that finish will prevent you from having a smooth ceiling. You will need about 36 tiles for that installation. To verify this or see what the layout will look like, go to the Stratford page look for the Ceiling Tile Calculator which is just below the Shopping Cart button. You can use that calculator to see how many tiles you'll need for a project, what the layout will look like, and even experiment with different tiles for a custom ceiling look. The Ceiling Tile Calculator is pretty simple to use, but if you have questions about the process please don't hesitate to call us at 800-557-0654. Rated 5 out of 5 by Mary Bammel from I've never installed ceiling tiles so easily as with these tiles, nor have I managed it on my own before. Granted, I was replacing my old tiles so I didn't have to rehang the grid. A ladder, pair of scissors, measuring tape and a marker was all I needed. I had no problems cutting the circle to affix the louver but I thought of my fabric circle cutter. I did try that - it will cut up to a 12" circle. That sliced through the tile with no problem and I will be using it to do the rest of my installation (I still have another 1500 sq ft +/- to go). I have also been impressed with the durability and strength of the tiles. They look great and gave my room a major facelift. Rated 5 out of 5 by Suzanne Hickes from The ceiling is finished and we love it. I raise Bengal cats and the tiles were used in two kitten rooms in our basement. The rooms look great. This is only the second dropped ceiling my brother has installed and he had no trouble at all. He liked working with the Ceilume tiles over conventional tiles. We didn't lose much ceiling height due to the thinness of the tiles. My uncle and cousin used the same tiles when finishing their basements and told me about them. I'm so glad they did. On a scale from 1-5 I give them a 10! Thanks for this super product. Can't wait until the entire project is finished. Rated 5 out of 5 by tpepper from Easy Upgrade Was happy I was able to order directly from the company. Ceiling tiles are as described very easy to install. Was able to cut tiles with scissors which simplified the project and was able to complete without assistance. I was replacing insulated acoustic tile which I left in place. They lay perfectly on top of new tiles working a insulation. The new ceiling looks beautiful. The appearance is decorative and almost looks like wood. I am very pleased with this product. The look and the ease of installation and would certainly recommend this product and would order from Ceilume again for another project. Rated 5 out of 5 by Gilbert Misiaszek from We are currently waiting for a fire alarm and (2) 6 inch can lights to be installed and wired in. After that she'll be done. We love the ceiling, simple, elegant, and a truly fast and clean installation. As soon as I get it done I will send pictures of the install. We have turned 400+ square feet of basement into a master bedroom and bath that now has hotel like qualities due to the fact that the ceiling looks so great. I will however recommend to anyone that if they go with the white tiles to purchase the white grid tape to match. My order for tape will be coming in soon. We are extremely happy! Rated 5 out of 5 by Tommy Reynolds from I would rate the Ceilume tiles 5 out of 5. They arrived exactly as described and were a pleasure to install. This was a new installation utilizing Armstrong grid materials. The tiles were very easy to cut with household scissors just as described in you instructions. Truthfully, I was skeptical and expected to go buy heavy duty scissors; but there was no need. As a "do it yourself" project, you couldn't find a better solution. These tiles gave me a very classy finish while minimizing my time investment. I would recommend to anyone as replacements for existing tiles or for a new project. Rated 5 out of 5 by James Nussbaumer from I purchased a room full of Stratford white tiles and love them. I rate them a 5 on a scale of 1 to 5. A few years ago, I used them in most of my basement and I get rave reviews from everyone. Finally, I broke down and ordered them for my workshop as well. This was mostly to keep sawdust from the insulation in the ceiling and because they were so easy. In this case, I actually installed them only 3 inches from the joists which was only possible because they are flexible and easy to cut and install. I proudly show them to any visitors and brag on how easy they are and how good they luck. Rated 5 out of 5 by Baycap from Initially skeptical, now a big fan! Updating a 30 year old basement, we needed to replace the old acoustic tiles that were chipped and stained. Found Ceilume online and called the helpful representative who not only sent a few samples but confirmed that many people also paint the old drop framing before installation of the new tiles. A small roller and some good oil base white paint made the old frame look new and when we started installing the tiles, I was very pleasantly surprised. When I opened the boxes, I was initially concerned about the relative light weight. As soon as the first tile dropped into place I was hooked. Trimming around six new can lights and trimming the outside edge tiles was incredibly easy. What was originally a storage area is now a nice room to start a wine cellar and hang out in. Rated 5 out of 5 by Karen from Love my new ceiling This product is fantastic. It is beautiful in my family room and I could not be happier how it turned out. Not only is it beautiful in my home, it was also a snap to put up. My husband did a 13'x22' ceiling in about 5 hours, and he is an absolute perfectionist. I think I could have done it in less time and I am 70 years old! The staff at Cielume was a pleasure to work with. They even sent two different tiles so that I could decide which one to use. I didn't even pay postage on them. It just doesn't get better than this. And the price was just as good. I have looked at other tiles and they were all at least twice the price, and they were delivered right to my home. I could NOT ask for anything more.